At SamKnows, we place great emphasis on the importance of accuracy. Our job is to help you to understand internet performance and whilst we invest heavily in new tests, we work equally hard to ensure the quality of your data. Our Router SDK and Whitebox are the most accurate ways to measure fixed-line internet performance. By running automated tests around the clock, we generate scientific and comparable data on network performance to your home, with results available for analysis in SamKnows One. A key element to achieving such high levels of accuracy is that we avoid running tests when you’re using the internet. That’s why you may find random stretches of time when your test results appear to be “missing”, such as in Figure 1. Don’t worry, this is most likely due to cross traffic preventing a performance test from running, which is intentional. Today, we’re explaining what we mean by “cross-traffic”, why it’s important to the accuracy of your results, and how it can affect the number of test results you can generate for fixed-line internet. “Cross traffic” is the term we give to any network activity that goes to and from the internet, via the router, that’s not generated by SamKnows. A good way of thinking about it is to imagine there’s more than one source of network traffic crossing paths inside your router. The Whitebox and Router SDK run tests according to a test schedule: some tests are hourly, some are daily, and others run between a set period of a few minutes. Before running a performance test, the test agents run a cross-traffic detection test to see how much of your bandwidth is available. When the level of cross-traffic exceeds the cross-traffic threshold, whether before or during a performance test, then the test stops. The test agents will then wait for a minute before trying again. However, if the internet is being used throughout, the “pause and retry” process will occur another 5 times before the entire test cycle is abandoned until the next scheduled test. Cross-traffic detection is managed by a threshold manager service, which measures the amount of inbound and outbound traffic across the WAN interface of the Whitebox and Router SDK, to calculate if someone is actively using the internet connection. In an ideal world, your bandwidth would be completely available all of the time, but that’s unrealistic. Even when you’re not using the internet there’s always some activity going on at a very low level. However, internet use rarely remains constantly above the cross-traffic detection threshold so it’s rare that we’ll never be able to run performance tests. After all, we only need very small windows of opportunity to do so. We also run cross-traffic detection in parallel with download and upload speed tests when testing mobile internet performance, whether on our Android SDK or the Rapid Build Framework. By measuring how much cross traffic was running at the time a performance test was taken, we can gauge the likelihood of it influencing the result. SamKnows tests only run when the available bandwidth is below the cross-traffic threshold. Why is cross-traffic detection important? 1. To provide an accurate and comparable dataset. We run tests under the same network conditions so that we can group and compare your fixed-line test results for reliable, in-depth analysis. 2. To measure the best possible internet performance. By only running tests when the bandwidth is completely available, we can run our tests under optimum conditions. We do this because our aim is to measure the best possible internet performance for any given test. 3. To ensure we don't disrupt your internet experience. We don't want to interfere with you streaming your favourite TV show because we're using your internet connection. We want to contribute to a better Future Internet, not hinder it! What can you do to reduce cross traffic? We encourage you not to worry about cross traffic at all. Most people install their Whitebox and go about using their internet as they normally would. However, there are certain operations that demand significant bandwidth, such as network-connected security cameras and wireless Hi-Fis, and prolonged usage can mean we're unable to test your network at all. 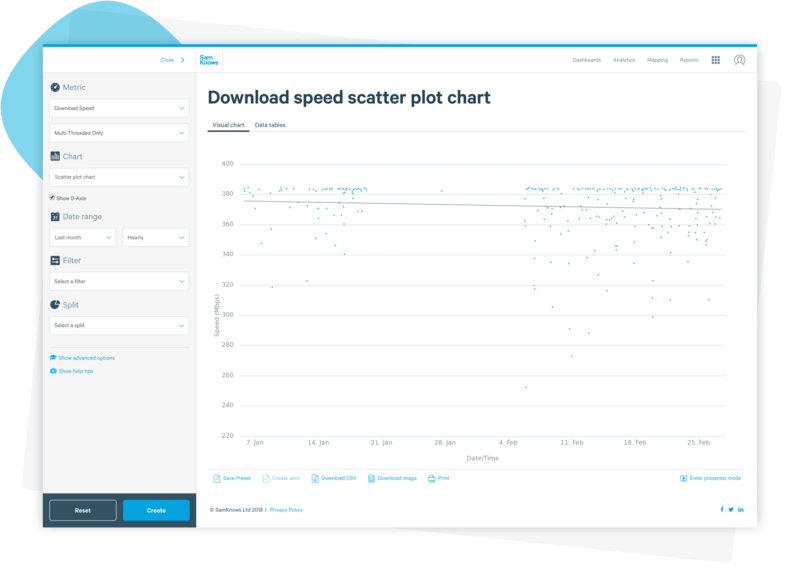 The easiest way to check whether cross traffic is consistently interrupting your performance tests is to generate a download speed scatter plot. If test results are minimal, than we recommend turning off a system that constantly uses the internet for a few hours a day. That way, your Whitebox can run some of its scheduled tests and give you the most accurate picture of your network's performance.